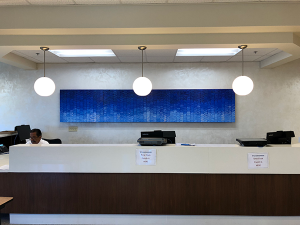 Week 5 of the move into our new Community Memorial Hospital Ocean Tower saw the installation of several significant pieces of artwork in our new main lobby, Emergency Department entrance, and dining room. Throughout the remainder of the hospital, countless local and regional works of art were hung in patient rooms, hallways, waiting areas, and clinical spaces. As we prepare to open our new Community Memorial Hospital this winter, we are working to install over 500 pieces of original artwork with pieces from Ventura, Los Angeles, and Santa Barbara County artists. Each floor of the hospital has a theme, and many placements match the use of the rooms. Playful pieces adorn the walls of the pediatrics unit and calming art comforts friends and family members in surgical and critical care waiting rooms. The entire collection was curated and organized by the Community Memorial Hospital Art Advisory Board (AAB), led by Co-Chairs Richard Amend, Susan Petty, and Barbara Hirsch. “The Kelp Forest” by Frank Bauer. 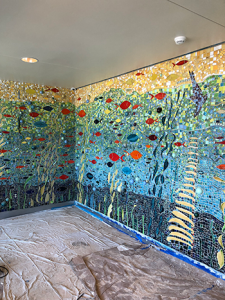 “The Kelp Forest” is a stunning mosaic by local artist Frank Bauer located just inside the Emergency Department entrance. Crafted from brilliant blue, green, and yellow tile and glass, the underwater seascape of fish, kelp, and sea creatures fits perfectly with the Ocean Tower’s modern coastal vibe. Other notable works by Bauer can be found in Oxnard at The Collection at Riverpark. Patients and family members entering our new hospital through the main lobby will be greeted by Hiroko Yoshimoto‘s stunning work, “Peaceful Ocean.” Located in a place of prominence over our new front desk, “Peaceful Ocean” conjures up images of luminous, glassy water and creates a calming focal point in the modern entry and waiting space. Yoshimoto’s newest works can be viewed in The Crosscurrent 2019 at Tokyo Metropolitan Art Museum beginning in January 2019, and in a solo show “Biodiversity: New Works” at Gallery Rin Tokyo, also in January 2019. Hiroko Yoshimoto’s “Peaceful Ocean” greets guests to our new CMH in the main lobby. Comprised of two installments located in the Ocean Tower Dining Room, “ELEMENTAL HUMANISM” by Lori Shocket, M.D. serves as a reminder that the human element is the force that holds our hearts and our commonality together. 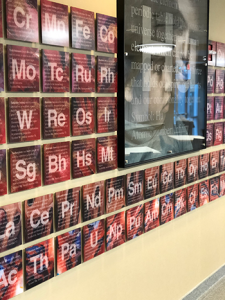 READ MORE about “ELEMENTAL HUMANISM” at our new CMH! “ELEMENTAL HUMANISM: Remembering the Human Element 2018” by Lori Shocket, MD. The CMH volunteer Art Advisory Board, led by Co-Chairs Richard Amend, Susan Petty, and Barbara Hirsch, has devoted countless hours to helping bring our new hospital to life with these, and many more, incredible works of art. Art Advisory Board members include Adam Thunell, CMHS Vice President of Operations and AAB Administrative Advisor, Dr. Moustafa Abousamra, Architectural Oversight Committee Advisor, Dawne Folkes Crushing, Colin Fraser Gray, Lydia Hopps, Mary Perez, Susan Scott, Denise Sindelar, Martha Spriggs, Hiroko Yoshimoto, and AAB Secretary Leila Benoun. We invite you to JOIN US on Tuesday November 27th from 4pm-7pm for a very special Open House celebrating the extraordinary collection of art curated for our new hospital by the CMH Art Advisory Board. This event will include a brief ceremony beginning at 5pm to recognize the CMH Art Advisory Board and Co-Chairs. CLICK HERE for event details and to RSVP for this special evening!